The B.Y.O.B. (“bring your own baon”) concept has a lot of benefits—from saving money to ensuring that your kids get proper nutrition. KING SUE rounds up some BYOB tips to make your child’s field trip, excursion, lunch or snacks appetizing and delicious. 1. Plan ahead. A well-thought out weekly menu will save you time. Make a calendar and assign specific meals daily, infusing healthy combinations of fish and vegetables with meat. Sit down with your kids when planning the menu and take them with you for grocery shopping. Surf the Internet or exchange recipes with friends. The secret is to make the menu as balanced and as exciting to eat as possible. 2. Cook in batches. Assign two days weekly—preferably Sunday and Wednesday—for marketing and cooking. Prepare the main meats and pack them in plastic wares with your special marinade. Pre-slice other ingredients like King Sue sausages for your pasta, King Sue hams for pizza, pre-boil or pre-grill as needed, then pack separately. This will save you time on daily meal preparation. 3. Take it easy. Select fuss-free, easy to prepare recipes that will not take too much of your time in the morning. 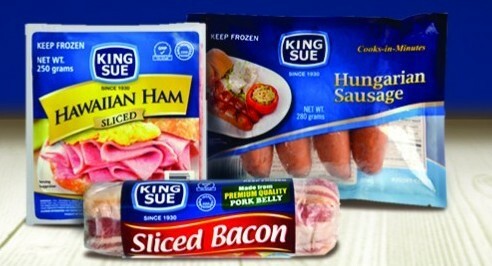 King Sue has pre-packed meats such as tocino, chicken nuggets, burgers, longanisa and a whole lot more. Mix them with eggs and potatoes for a yummy omelet, as a nice add-on to a sandwich (don’t forget the greens! ), or to a mouthwatering pasta or soup. Or you may simply fry them and pair them with a simple salad and you’re good to go. Meanwhile, King Sue Hawaiian Ham can be mixed into Yang Chow Fried Rice or used as a topping to pizza. If you have extra macaroni at home, prepare baked mac using King Sue old English pork sausages and German Franks and top with quick-melt cheese boost. Looking for other ideas, check out www.kingsue.com for recipes. 4. Jazz up the packing. If you’re a crafter, doing a bento box is a fun idea. There are also other means to jazz up the lunch box. Cookie cutters can turn fruits, cheese, and breads into fun-shaped food items. Or try to cover the rice in cling-film so you could stick on some googley eyes, sticker smileys, cut-out hearts, and other modern emoticons. Insert a post-it with one liners such as “Good luck on the exams today!” or “Enjoy your lunch. I love you”. You may not see his wide grin when he opens his lunchbox but wait till he gets home and smothers you with hugs and kisses.